Home Academy Which Bookmakers offer Money Back Specials for existing customers? Back in 2004 Paddy Power came up with the holy grail of marketing strategies MBS – Money Back Specials. Paddy would give you money back as a free bet if predetermined events happen during a game and of course if you lose! It was such a huge success that every bookmaker soon jumped on board with their on take of the same deal. Money back specials are a great way to hedge your bets and provides some downside protection. 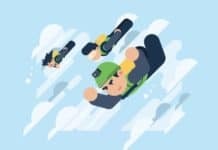 What are Money Back Specials? Money back specials offer a form of cover if a specific event happens during a game all losing bets are refunded. Whilst it sounds great, be aware that the money given back to you is returned as credit in the form of a free bet NOT cash back. 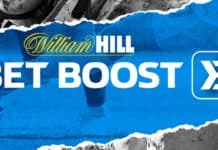 To save you time we’ve compiled a definitive list of bookmakers that offer money back specials for existing customers. In the table you’ll find a full list of MBS sports for each bookie and we’ve highlighted the terms and conditions to be aware of. To find a specific money back deal, scroll down to the match you want. 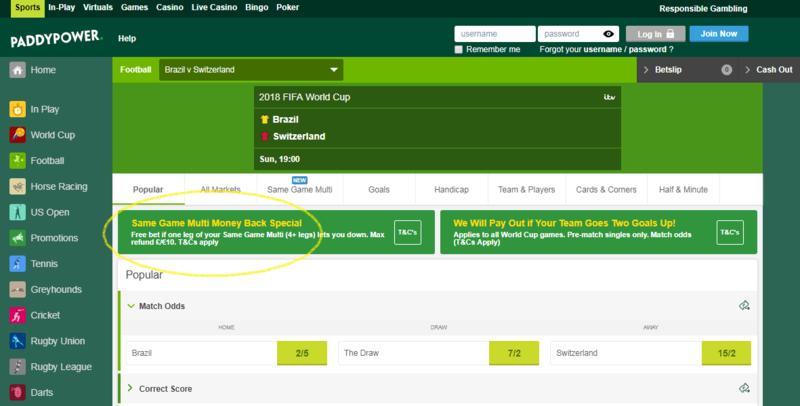 Make sure the game offers MBS by ensuring it has “Money Back Free Bet” in red at the bottom-right of the match. In most cases MBS offers are available for every game but make sure you check. Select the game you’re interested in – In this case it’s Brazil v Switzerland. 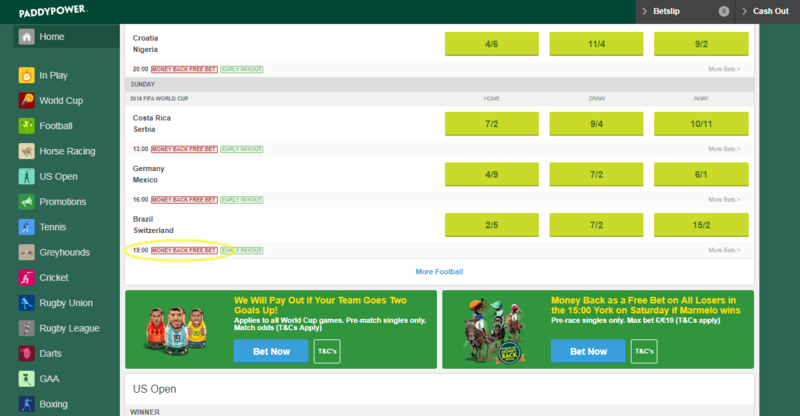 Above the Match Odds you should see two or more banners with details of the MBS. Make sure you read the terms so you understand the conditions of the offer and pick your odds. The MBS is automatically added as part of your bet. TIP: I have a habit of forgetting which MBS offers are for a particular bet. So take a screenshot of the offer using your mobile or Print Screen key on your laptop. MBS isn’t just for football bets! It goes without saying really but money back specials do not apply when placing accumulator bets. If your looking for a hedge, you should try acca insurance which gives you cover if one leg of a 4+ fold stake loses. MBS generally cannot be used in conjunction with any other offers – including new customer and special promotional deals. Let’s say you take an offer such as Money back if Messi scores anytime against Iceland and you bet that Argentina will win the game 2:0. If you end up winning your bet and Messi scores a goal during the game you will not receive the money back offer. So generally it’s best to use this offer in a hedge strategy, where you would be certain that Iceland would win the game, but you’re covered if Messi scores and Argentina wins. As with anything are a few caveats to be mindful of when it comes to money back specials. This catches most new punters out which is the maximum amount you can receive as a free bet. As an example Paddy Power offers a maximum £50/€50. So if you have placed a £10 bet, you’ll receive £10 in bets. Conversely If you place a £200 bet, the maximum you should expect to receive is £50. Checkout our complete list of bookmakers and MBS deals in the comparison table above. This goes without saying but the conditions of the offer are for pre-determined events in the game. So punters need to place a bet before the game starts, otherwise you’ll miss out. 3. Bookmaker reserves the right to remove the offer at any time. Unfortunately we are controlled by the powers that be and ultimately it’s the bookmakers that either let the offer stand or decide to pull it. I must admit I haven’t seen this myself but have heard of other punters with offers being pulled. In either case it is very rare. For a more complete list of terms checkout Paddy Powers MBS Rules. MBS on the High Street? 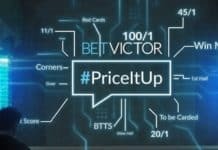 Money-back promotions have become so popular in recent years that even high street bookmakers have got into the game. Hopefully you now have a better understanding of money back specials and when to take advantage of them. Our definitive comparison table should give you all the ammo you need to decide which bookmaker offers the best MBS deals for your particular sport. If you’re look for an asymmetric bet (more upside with minimal downside) then money back specials offer you a great and simple strategy to minimise any losses. Just don’t go placing MBS bets purely on the insurance and not on the value of the odds. 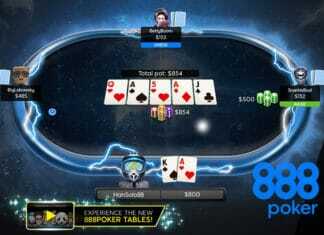 Next articleWhich Mobile Casinos accept Payforit deposits?